Creativity and individuality take on a whole new meaning with this water effect. 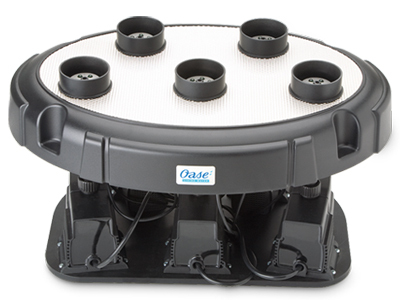 The Water Starlet can be integrated in any environment– water pool, swim pond or bed of gravel. There are no limits to your ideas. Thanks to brilliant white LED technology the water jets from the 5 nozzles create unusual impressions. The permanently set program sequence shows a wide variety of recurring water patterns. To an increasing extent gardens and terraces are becoming living space for people, for relaxation and wellness or for spending the evening with friends. Consequently the transitions between living room inside and garden/terrace outside have become fluid. In creating living spaces acoustic and visual accents, as well as appealing design, play a significant role, what element offers more individual possibilities in the garden than water? Combined with light it has always had a magical effect on people. 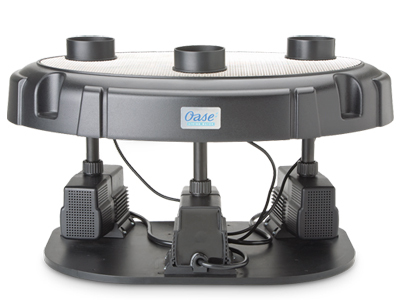 Playful but also harmonious, the Oase Water Quintet visual orchestra characterises the new generation of water features. 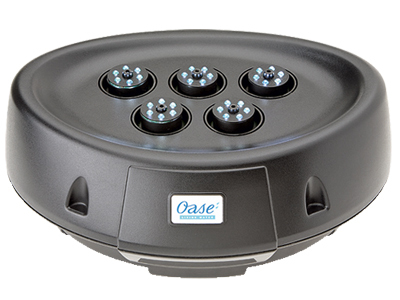 Extremely flexible implementation, Oase Water Trio and Oase Water Quintet can be optimally integrated in every custom garden concept. Terraces become living spaces where you can sitback and watch the orchestra. Thanks to the Plug ’n’ Spray concept water effects can be quickly installed, the permanently set programs for variation of speed and fountain height can be easily selected via remote control.